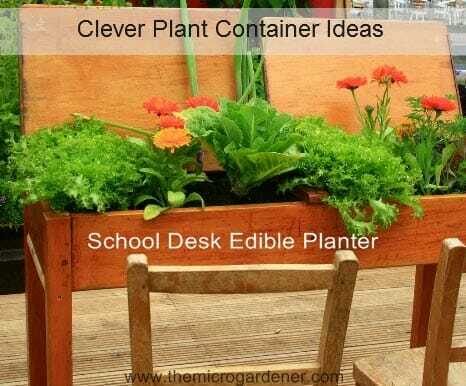 Need a little help with Container Gardening ideas? What to do with pots? Which container to choose to grow your plants in? With plenty of inspiring photos, these articles will help you visualise what’s possible in your garden. Do you feel your garden is hard work? Too much digging, weeding, watering and fertilising? For minimal results? The principles for doing less work, with greater rewards are simple. 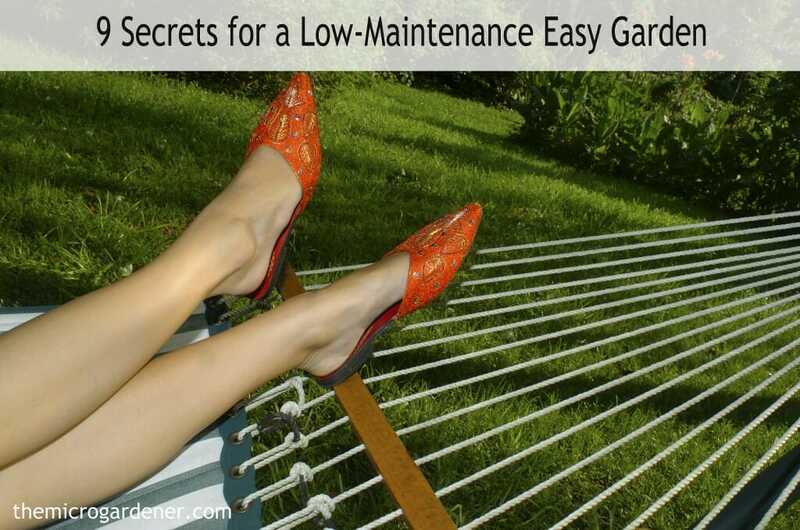 These are just a few of my secrets for creating an easy garden. Dig in! One of the secrets to less work in your garden is thoughtful planning. You may feel overwhelmed if you aim for perfection. I spend time applying Permaculture principles to ‘design out’ potential problems. You can refine and add to your plan later. Begin one project at a time. A simple DIY edible planter is a good place to start. Once you gain confidence, you can create the next element in your garden. 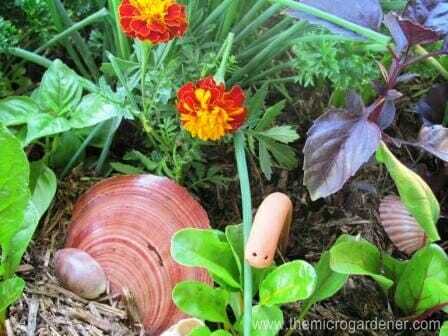 Locate your edible containers and food gardens close to your kitchen for easy access. Are you trying to grow a garden with little rainfall? Struggling with a dry season, heat, drought or water restrictions? If so, it can be especially tough to grow food. 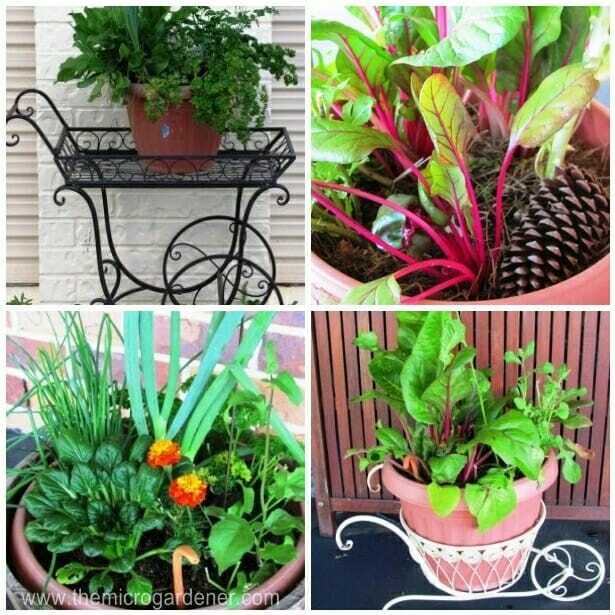 You CAN grow healthy crops in pots – with the right strategies. These easy, water saving tips may help YOU achieve an abundant harvest. One key to success is to adapt your growing techniques to keep your garden alive and thriving. Discover the best containers to choose; how to improve your growing medium; suitable plants; where to position your pots; and how to maintain them to save water. 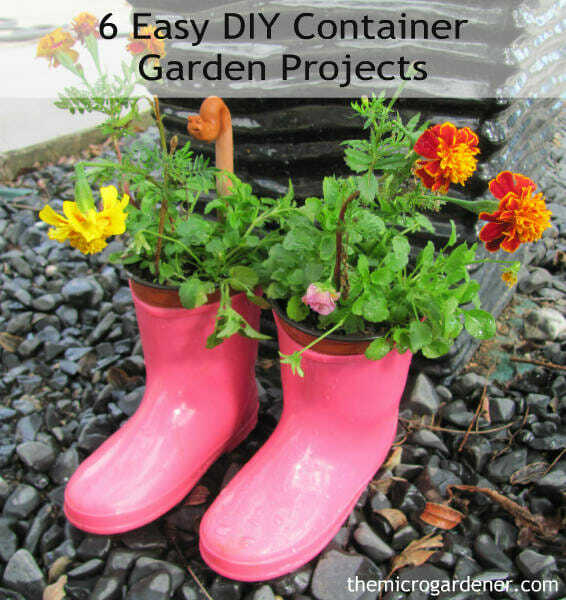 Looking for creative DIY container garden projects? 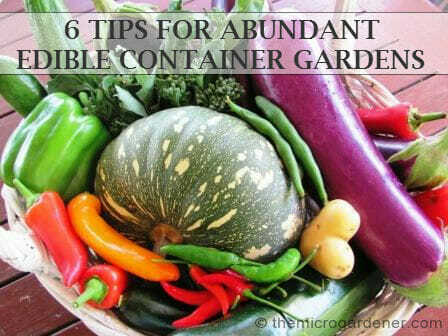 Micro Gardening in containers offers you SO many benefits. If you are a beginner or need some ideas to get started, I’ve compiled these tutorials to inspire you – regardless of your space, skills or budget! I change the flowers in these bright pink gumboot planters seasonally – an easy way to upcycle outgrown boots. I also plant in my adult pairs when they split. Just drill holes in the soles! I put tiny pots into the top of this pair & they sit nicely with a clay worm as garden art. After moving house sixteen times, I’ve learned to adapt my gardens to all sorts of spaces – large and small. This is a handy list of plants I’ve found to grow well in containers plus the depth of soil they need. If you have difficult soil like sand, clay or rocks; limited space or funds, then I suggest you try growing at least some of your food in containers. Pots offer loads of benefits. Do you want to make a quick mini garden? 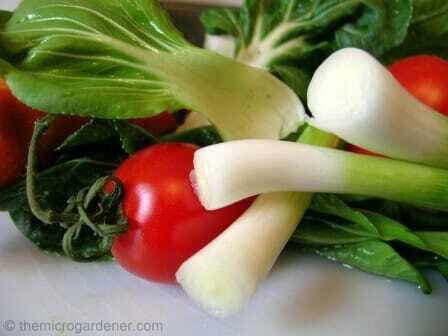 You can grow healthy ‘fast food’ like salad veggies and herbs in a simple box. Best of all, you can make it in about 15 minutes. The bonus is you’ll be eating the rewards in just a few weeks for only a minimal investment of time AND money. Let’s get started! A wide variety of seasonal herbs, veggies and flowers can be grown in micro gardens and can reap you a rich bounty of food for minimum effort. 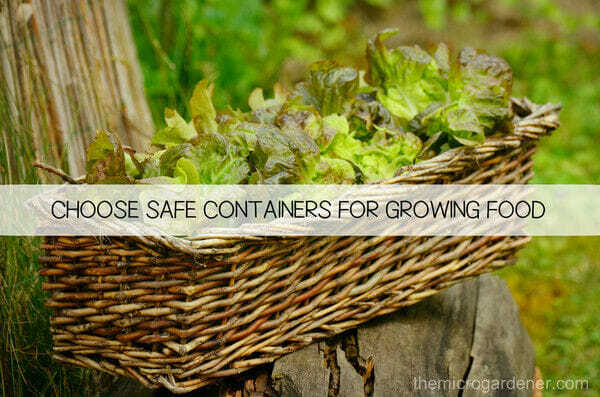 Do you want to grow food in safe container gardens? Whilst not wanting to dampen your enthusiasm for using repurposed planters, I encourage you to do your due diligence when choosing that perfect container. The majority of pre-loved or second-hand goods may well be safe to use. However, before you reuse a container for planting in, there are some considerations, other than whether it can hold some dirt and leafy greens! Why buy new when you can DIY and save money? Need a little inspiration to get your garden started in a container? Check out what some amazingly creative people around the globe have used to grow a garden in – just about everything! This old desk school desk has a new life in the garden as an edible planter filled with luscious lettuces, shallots and colourful flowers. Ideas for Repurposed Planters … INCLUDING the Kitchen Sink! Stuck for where to start? Looking for inspiration for what to grow your next garden in? Look no further! I hope you like these creative planters as much as I do. A new meaning for ‘potted’ plants! 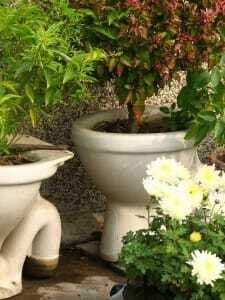 These old toilet cisterns have also been given a new life as planters. Porcelain is long lasting and with built in drainage, their prior lives could be concealed behind other plants or a bamboo screen around the base. Ever wonder why some people’s gardens look so beautiful, full of character and have that special charm? If you look closely at pictures in garden magazines or visit open gardens and nurseries, you’ll notice one of the clever design tricks they use is adding interesting features, repurposed containers and collections. 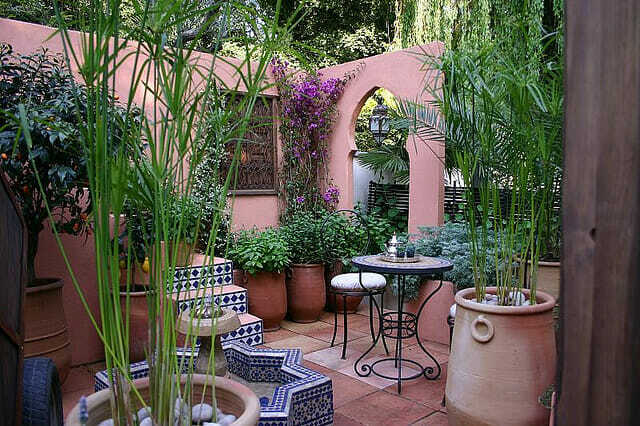 This small courtyard garden is a good example of clever design and use of a collection of new and old pots. A seating area, water fountain, screening plants and coordinated colours also help unify this tiny space. and enhance the visual appeal so you want to spend time in that special space. With a limited space and budget, it’s not always possible to buy new plant containers or garden art but you can still achieve a dream look and great functional growing spaces by ‘turning old into new.’ You don’t need special skills – just a little inspiration … and perhaps a little time to hunt around for the right object.